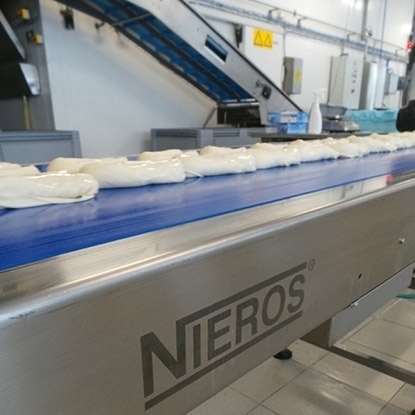 NIEROS® food-mixture weighing lines are used in the preparation of meat and vegetable products such as sausages, salami, meat mixtures and salad mixtures. Easy to use, they are a convenient and ergonomic solution for all food industries producing mixtures of any kind. Designed for small or complex production plants, each unit is custom-built to match your precise requirements in terms of production process, type of end product and production capacity. With a variety of custom features and additional options, NIEROS® food-mixture weighing lines enable precise dosing and high-quality preparation of meat or vegetable mixtures, following the recipe instructions while conforming to the requirements of HACCP, IFS and NSF. A food technologist writes the mixture recipe and enters it into the system. Ingredient quantities are displayed at the workstation guiding the worker to prepare the adequate food-mixture. Food-mixture ingredients are placed in separate stackable tanks or containers. Every tank or container is lifted and tilted by a push-button tilting system, enabling easy and manual dosing of ingredients into a 200- or 300-litre Eurobin. Every bin is placed on a mobile carrier with a weighing scale and manually moved from one ingredient container to another to provide the correct food mixture. A weighing scale controls the food-mixture weight at every point along the process, ensuring the correct total weight and quantity of the mixture.